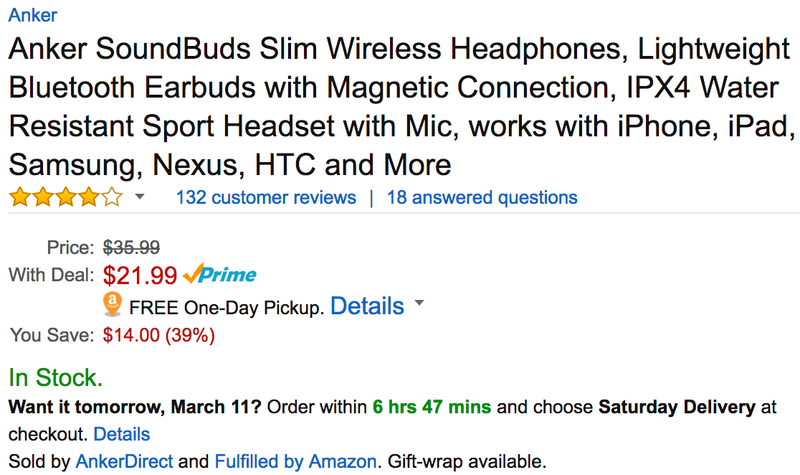 AnkerDirect via Amazon is offering its SoundBuds Slim Wireless Headphones for just $21.99 Prime shipped. That’s $14 off the original list price and the lowest we’ve seen for them at Amazon. These lightweight Anker SoundBuds have 6mm drivers, Bluetooth 4.1, an IPX4 water-resistant shell and a 7 hour battery. Rated 4/5 stars by 132 Amazon shoppers. Customizable Fit 3-size EarTips and InEar-Hooks provide a sturdy, comfortable hold. Cable measures 55cm for universal fit and no annoying tangles. Adjust your cable length with the FitClip, or affix to your clothing for extra security via the Shirt Clip. Water Resistant IPX4 nano coating ensures complete defence against sweat, or rain. Push yourself to your limit during workouts and SoundBuds Slim will handle your audio effortlessly. Listen Longer Play for up to 7 hours; longer than most earphones on the market. Bluetooth 4.1 ensures a connection range of up to 33 ft, compatible with the iPhone 7 or any Bluetooth device.